Rafael Benitez is expected to be installed as the new Real Madrid manager after his season with Italian club Napoli finishes on Sunday. The former Liverpool manager, 55, has not yet signed a contract with the 10-time European champions but negotiations are at an advanced stage. Carlo Ancelotti was sacked as Real Madrid manager on Monday after two seasons in charge at the Bernabeu. Italian Ancelotti, 55, secured Real's 10th European Cup last season. But this year they were knocked out by Juventus in the Champions League semi-finals, while Barcelona won La Liga. 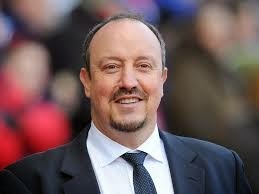 Spaniard Benitez has managed in his home country before, winning two La Liga titles and the Uefa Cup with Valencia. He has been at Napoli since 2013 leading the Serie A side to the Coppa Italia last season. The Spaniard had also been linked with the vacant job at West Ham, following the departure of Sam Allardyce.